You know what I did last summer? 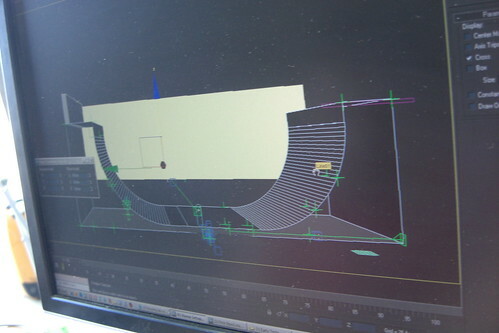 Last summer I was freelancing for the lovely Team Rubber, when I overheard one of the film making dept say “Now we just need a skateboarder to skate the halfpipe..”. I immediately volunteered myself for the role. “Can you skate a halfpipe?” he asked. “Um.. yep, how high?”, I replied. “13 foot”. “..err.. (mumble)… can I come along and watch though?”. I tend to work on projects with a local working copy on my laptop of whatever it is i’m working on, so pre-empting the current meme of working away from the office, I offered to go along to the shoot, help out where I could, learn about the video shoot process and work the rest of the time from my laptop. The video shoot was on an old air base in wiltshire. I arrived early in the morning and couldn’t figure out how to get on site, so I circled the perimeter trying out various back roads and possible routes in, occasionally encountering other car drivers, eyeing me up suspiciously as I loitered. I eventually spotted some of the crew arrive and unlock a gate, and sure enough most of the cars I had encountered earlier turned out to contain runners, directors and extras. The ramp was already set up and I was dying to have a quick go on it, but then the heavens opened leaving the uncovered ramp to get soaked. I prayed that the weather would clear up, as the shoot would have to be postphoned or cancelled if the rain continued. Fortunately it cleared up soon after, and became a scorcher of a day so I went and swept the surface water off the ramp to help it dry out quicker. I climbed onto one of the platforms just to see what it would be like to drop in, but being considerably higher (4.5ft higher specifically) than anything i’ve skated before, there was no chance of me giving it a go, at least dropping in from the top. I skated it from the bottom, pumping the transitions to gradually get higher and higher up the ramp, but looking back at the embarrassing video clip I persuaded someone to film on my camera, I can’t have gone any higher than halfway towards the top. Fortunately, the ramp owner, and UK vert legend Pete King arrived to provide the goods. 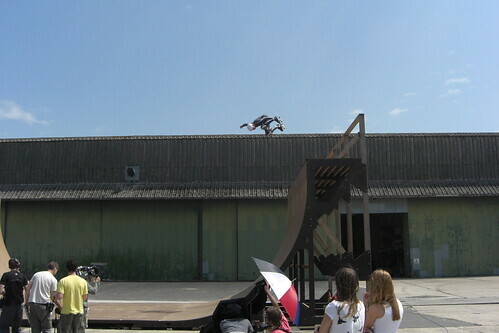 The plan was to use the skater as a reference for a CGI character, so the CGI guys set up a makeshift studio in one of the hangars and created a 3d model of the ramp. 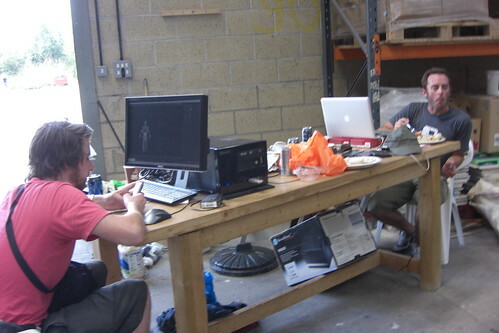 Pete was dressing in a rather fetching grey one-piece (“chroma key” suit) with white tape to use for CGI reference. As you can see from the photos, he didn’t disappoint with the skating – pulling some massive airs for the camera. These photos are not modified – he was consistently getting airs that high, and landing them most of the day, despite the blazing sun and being asked to repeat the sequence over and over. As if hanging around on an air base watching a skateboarder dressed in a lycra suit wasn’t surreal enough, the actors, now dressed as american GI’s, were bought in to encourage and heckle Pete, sometimes while he was there, sometimes when he wasn’t. Then the chopper arrived. Ever wonder why insurance companies have a problem with media types? Luckily i’m a software developer, so *cough* no chance of my car getting hit by helicopter-related flying debris on a film shoot..*cough*. I made myself handy by securing a nearby gazebo with breeze blocks before it (and the helicopter) took off again. p.s. you can see the final video here.